Look into community groups where there is no age limit, like an astronomy group or chess club. Gifted young people often enjoy discussing their interests with, and learning from, like-minded adults. There may be local lectures in your area, too, and authors often visit bookstores to discuss their work. Talk to your child’s teacher about special projects in school that will allow your child to pursue her affinity. She might like to "check in" with her classmates once week by talking to the class for five minutes or so to share her progress and ask for their feedback. And she should be invited to set up a display or do a presentation for the class when she is finished. Teaching others is one of the best ways to learn. Consider finding a tutor. Children who don't need remediation can still benefit from a knowledgeable instructor who can provide him with the extra challenge and stimulation he likely craves. Podcasts like This American Life (a grab-bag of general culture, math, science, psychology, current events, and more), RadioLab (science), The Naked Scientists (science and medicine), The New Yorker Fiction podcast (the writing craft), Intelligence Squared (current events, policy, and ethics), Planet Money and Freakanomics (economics and statistics) are all (free) goldmines for curious young people. Since all of these podcasts were created with adult listeners in mind, parents may want to preview them first. The Art of Problem Solving – This site contains numerous math resources for students in 6th-12th grades, including book recommendations, online courses, and even an online community so students can connect with other math-lovers around the world. Math Forum – Users can access a new math problem each week, play KenKen, connect with other young mathematicians by joining the Virtual Math Team, and more. Tech Literacy – Visit our dedicated resource page for information about opportunities to learn coding, tinker with robotics, and more. 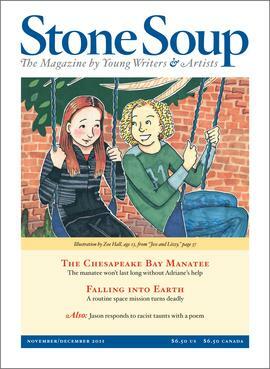 Stone Soup – Contributions to this international English literary magazine come from young writers and artists between the ages of 8 to 13. The magazine features stories, poems, illustrations, art, and book reviews. New Moon Girls - New Moon Girls is an online community and print magazine where girls create and share poetry, artwork, videos, and more; chat together; and learn. Teen Ink – This organization offers a national teen magazine, book series, and website devoted entirely to teenage writing, art, photos and forums. Students must be between the ages of 13 and 19 to participate, register, and/or submit work. The Young Idealist – Everyone who writes for and runs this quarterly journal is under the age of 21. Content in The Young Idealist aims to encourage the next generation of thinkers, policymakers, and leaders through the peer review and publication of political, social, and environmental ideas. Essays proposing positive change are critiqued and developed by an editorial board and an active readership. The Concord Review – This periodical publishes the academic research papers of students in the secondary grades. Look for local performance opportunities. Community theater companies and musical performance groups are great places for kids to gain experience. Those not yet in high school might be able to volunteer to work behind the scenes in high school or college productions, giving them valuable experience about the world of theater. Try taking kids to open mic nights at venues that allow all ages; even those not yet ready to perform in public will learn from watching other performers. Young Composers - Upload compositions of all genres for feedback from forum participants, or simply read and learn from reading discussion threads and listening to others’ work. Composition Competitions – This compilation of competitions around the country may inspire young composers to develop and polish a piece they can enter. Online Course: Photography for Kids - For serious young photographers, consider an online, project-based course from the online learning marketplace Udemy. The course, which consists of 20 video lectures, teaches kids the basics of photography and gets them thinking as they work through assignments. First-time Udemy users will pay only $24 for access to the series. Photography Competitions – High school students may want to enter their own best shots in some of the competitions listed here, and they can learn a lot from looking at winning images, too. Film Competitions – Those interested in film can submit their work to The All American High School Film Festival, and filmmakers seeking to spread a social message should investigate the Teen Truth competition. The National Film Festival for Talented Youth accepts both film and screenplay submissions. One more quick, but important, note: Remember that even the brightest kids need time to be kids. Be sure that their after-school agenda is composed mostly of activities they've chosen, and give them plenty of free, unstructured time to spend letting their imaginations run wild.